Women and little kids have one thing in common - crying spontaneously for the weirdest reasons ever (no offense, ladies). Remember the time you first saw Barrack Obama? Crying. 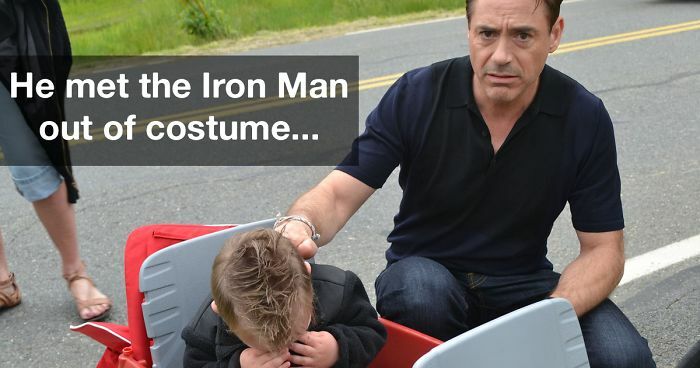 The time meeting Iron Man out of this costume? Sobbing. Having to eat a plate of veggies? Bawling your eyes out. These and many other reasons are absolutely reasonable to set a kid crying, and they have been documented in a website called 'Reasons My Son Is Crying' by Greg Pembroke. He collects photos of funny babies sent from parents around the world and posts them to his website. He's even made a book on crying for no reason which you can buy on Amazon! So whenever you have a temper tantrum about the fact that you cannot fit all the crayons in one hand, remember, that there's probably a funny kid who also feels the same. Have more examples of why do babies cry? Add your picture and quote to our list below and don't forget to vote! The look on Obama's face. #4 She found out that I have a name other than "Mum"
I mean, fair enough. I'd cry too. I would cry too if I saw that video. But the football ate his hair first! To be fair, I cry when my dinner isn't ready. And then I eat cereal. Seems legit, I wanted to marry my mom when I was her age. And I'm a straight girl. #13 I said "good morning"
Frustration is possibly the worst emotion a child can have. Chin up, little one. Things get better. Do you think she wants to slap him? He must protect his BUSINESS! That is going to be my kid one day, we love Halloween! Oh man... the person holding her is SO OVER IT. This is so hilarious! ???????????? As a parent I would not be amused. Not one bit. Ummm, hello, who doesn't lick doormats? I'd give him just a tiny tiny little bit, just to show him the taste and watch the reaction on his face. I would cry too if that happened to me! My gorsh! A right Royal hissy fit, this! Haha....my son saw me carrying a tampon when he was younger and got mad bc I didn't give him any string cheese! #56 I wouldn't walk across "the bridge"
If the Lego-man was bald ..
them little kid abs tho!!!!!! #69 He asked when he could be a baby again. I told him "never"
Oh. I always wanted to do that too little darling.